It is an environmentally safe and superior trivalent chromate alternative to hexavalent chromates. The Department of Defense and the United States Navy initially developed and tested this product for use in extreme applications. 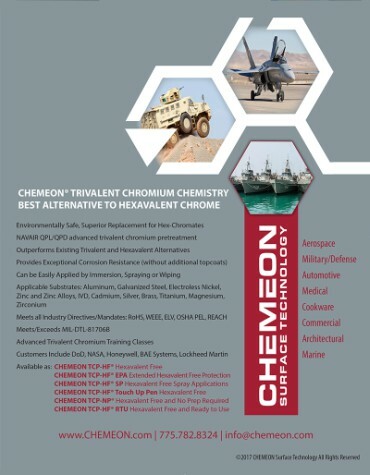 Surpassing over 15,000 test panels CHEMEON TCP-HF (Hex Free) outperforms existing trivalent and hexavalent alternatives in wear and corrosion resistance (without requiring additional topcoats), while being more economical in cost per application. TCP-HF can be applied in bulk and barrel applications, without damaging the coating integrity, and is versatile enough to be applied over a wide range of materials, including zinc and alloy plating, raw zinc die cast, and aluminum. As an anodize seal it is an economical alternative to chromic acid, nickel acetate, nickel fluoride, and hot water seals. Applications	 Chemical conversion coatings. Anodized aluminum sealer. Passivate and anti-tarnish. Industry Specifications and Standards	 MIL-DTL-81706. MIL-DTL-5541 Type II. MIL-C-5541 Class 1A and Class 3. ROHS. REACH. WEEE. ELV. OSHA, ASTM B921. QPL. Substrates	 Bare aluminum and anodized aluminum. Zinc and zinc alloys. Magnesium. Galvanized steel. IVD. Cadmium. Silver. Brass. Titanium. Stainless Steel. Iron alloys. Zirconium. Properties	 Extended corrosion resistance. Paint adhesion. Electrical properties. Coating durability. Corrosion Resistance	 336h NSS bare aluminum. 3,000h+ anodized aluminum. Product Advantages	 Lower solution operating temperature. Harder than conventional hexavalent. Can be applied and dried in bulk. No topcoat required. Extreme temperature exposure - UP TO 450°F. Average coating weight 22.88 mg/ft2. Industries Served	 Aerospace. Military/Defense. Automotive. Medical. Cookware. Commercial. Architectural. Marine. Avionics. Electronics. Heavy equipment. allows more flexible pre-treatment process parameters. It is optimized for spray applications and effective as a pre-paint/powder coat anti-corrosive chemical. Touch-up and field repair use. Hexavalent chrome is a known carcinogen and highly regulated. TCP-HF contains a small amount of trivalent chrome which is not a carcinogen and is non-toxic. Disposal of hexavalent chrome is more expensive. Hexavalent chrome must be reduced to a trivalent state where the converted trivalent chrome content is precipitated and removed as a non-toxic substance. The wastewater is pH adjusted and sent to drain. Hexavalent chromate baths require frequent dumps which puts more demand on the treatment system. Chemicals, manpower and compliance issues are costly.TCP-HF, however, uses chrome in its non-toxic trivalent state. The amount of trivalent chrome in the TCP-HF bath is minimal and the rinse waters generate only trace amounts of trivalent chrome in the waste stream. The rinse water in most cases only requires pH adjustment for discharge to the drain. A TCP-HF bath is very rarely dumped. The Navy has operated TCP-HF process baths for over 2 years without dumping and remaking. TCP-HF solution is simply added back to the tank to account for drag-out and evaporation losses. Hexavalent chromate systems must be heated. TCP-HF is applied at room temperature and does not require heating. This saves in energy costs and production down-time during bath start-up. Hexavalent chromates must be ventilated and the air must be discharged within applicable environmental limits. TCP-HF is odorless and does not require ventilation. Again, energy, manpower and compliance savings are realized. TCP-HF is a drop in replacement for hexavalent chromates. Pre-treatment chemistries and application method (Immersion, spray, wipe) will remain the same. This eliminates the need for additional equipment or system retrofits. TCP-HF is less acidic than hexavalent chromates. Etching of the part is minimized while the part dimensions are maintained. TCP-HF withstands temperatures that meet MIL-DTL 81706B 250°F allowing for greater process flexibility. Hexavalent chromates do not perform as well when subjected to elevated temperatures. TCP-HF has performed as well or better than hexavalent chromates in a variety of applications and tests. The Navy tested the product on entire airframes for the F/A18 as well as S3 tail sections. The planes were flown for an extended period with excellent long-term results. It has also been tested and approved for the exterior framework of the United States Army Amphibious assault vehicle being manufactured by General Dynamics at GDDS Virginia. Of twenty products tested TCP outperformed all by nearly twice the neutral salt spray corrosion testing.